FUNCTIONALITY: Can accommodate laptop computers up to 17" in screen size. Features a padded compartment to keep your laptop safe and secure. Various pockets and designated holder slots. Ideal for airport travel as the rear has a zippered opening to slide a suitcase handle through. FEATURES: The Lisbon Briefcase features a front compartment that expands and has two pockets for smart phones, 2 pen holders, 2 business card slots, a ID Window insert, and a zippered pocket. 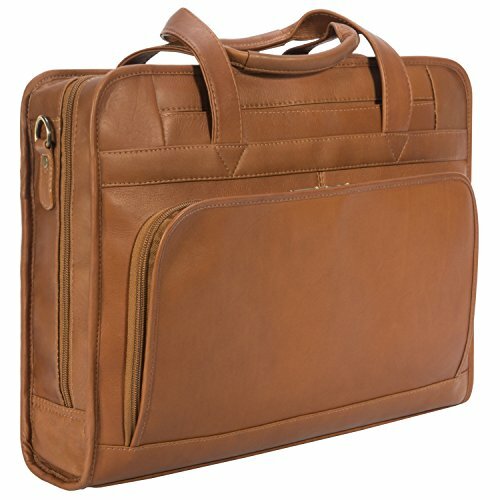 Large main zippered compartment holds a 17" screen size laptop, and has a padded slot to keep your computer snug and protected. Bag features a light-weight leather and nylon shoulder strap for easy carry. Comes with a branded dust bag to keep your bag protected. Dimensions: 17" (L) x 12" (H) x 4.5" (W).